Developer promises new and improved version of the mobile gaming hit. Flappy Bird, the simplistic, infuriating, life-ruining mobile game that was deleted from app stores after its creator couldn't deal with its phenomenal success... is coming back. Vietnamese developer Dong Nguyen tweeted last night that he WILL release the game again, despite complaining that he couldn't take the attention he'd generated. @paperwarlock I don&#39;t work by plan. I will release it when it is done. @paperwarlock I don't work by plan. I will release it when it is done. It won't be the exact same game, but an improved one, he says. @Colin_052099 It will not be the original game but a better one. I keep my word. Flappy Bird became a mobile gaming phenomenon at the turn of the year, leading Apple's app store for month and earning Nguyen as much as $50,000 a day in advertising (£30,000). In an interview with Rolling Stone, Nguyen spoke of how his parents' house was hounded by journalists and paparazzi as his financial success became widely known, while abusive messages poured in from across the world. One woman told him he had "distracted the children of the world". Office workers complained they had lost their jobs due to compulsive Flappy Birding. "At first I thought they were just joking, but I realize they really hurt themselves," he says. Despite that, 10 million more people downloaded the game after he announced it would be taken off app stores. 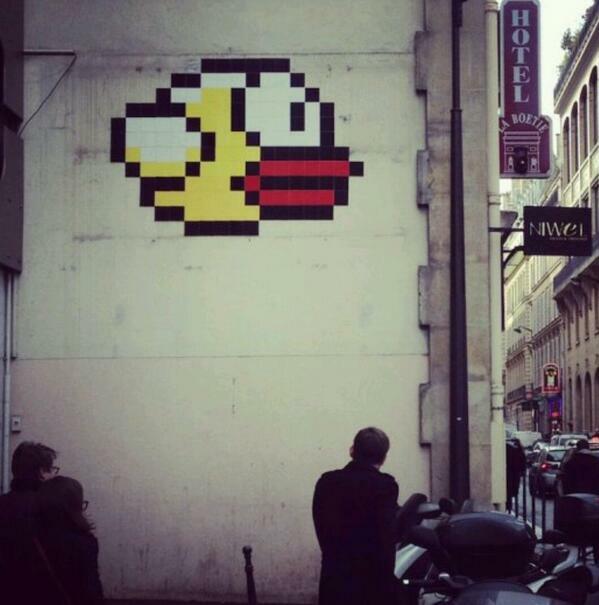 The annoying little yellow bird remains a kind of digital pop culture anti-hero - loved and hated by millions. @dongatory found this the other week. Aparently in Paris. Hope all is well. And remember, this is the best and most reliable way of beating Flappy Bird when it returns. WELCOME BACK YOU WONDERFUL, INFERNAL BIRD.